Construction at Abbey Wood Crossrail station is picking up speed. Some new dates have been revealed regarding forthcoming changes. The existing tracks on the line from Kent to London will be realigned, beginning in May. 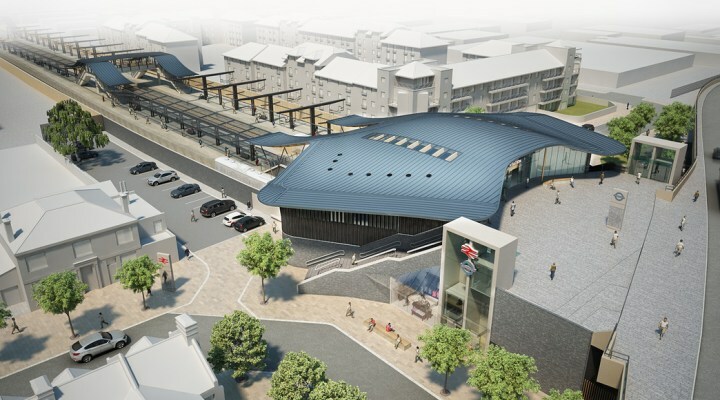 Construction on an interim station is starting now and will be open in October 2014, when the current station will be demolished. 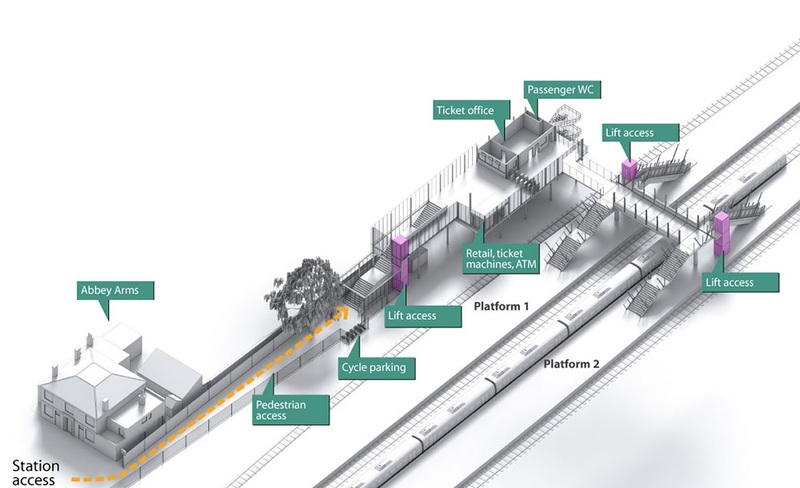 Access to the station from the north will be blocked whilst this happens, with access reinstated when building works are complete by Autumn 2017. The tangle of ugly, concrete 1970s ramps seen above are to be demolished. This picture also shows the amount of land by the station that is currently used for car parking and low rise industrial purposes. I would expect all that to be become high density housing in the near future. Below is an image of the new temporary station building, constructed on the former station car park. 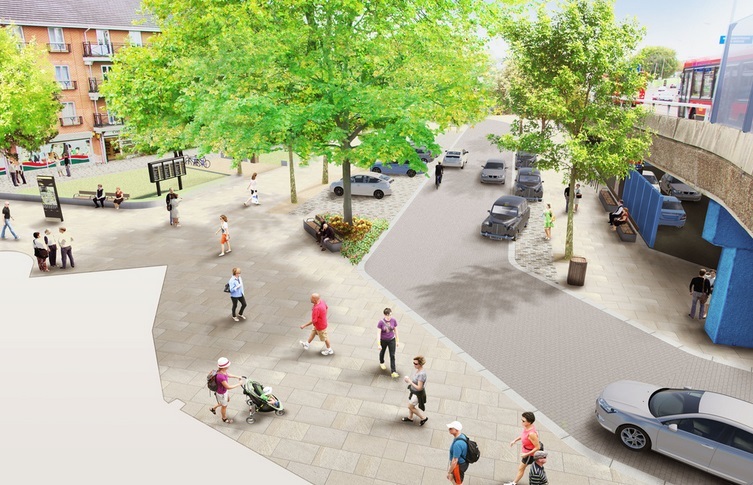 Bexley and Greenwich boroughs, along with Crossrail, have been working with Urban Movement to develop public realm proposals to enhance the station approaches and Harrow Manor Way. 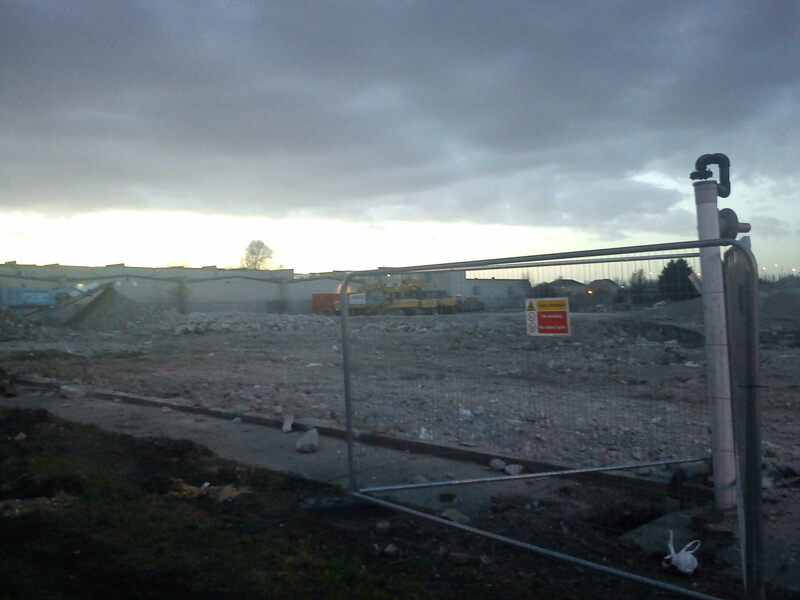 This shows the current bin store for shops removed. A recent post on the Bexley is Bonkers blog highlights the difficulties shops are having with the bins so a new location will need to be found for them, if possible. More car parking is proposed. This will make up for the loss of spaces in the station car park, and no doubt Bexley council are salivating at the charges they hope to levy. No images are shown of the main shopping parade which is in long term decline. That should be the priority for street improvements. To the north of the station the car park will be reduced. Better quality, lighter, more attractive paving will be installed. The pillars of the bridge are shown painted. Not sure about the blue. These are very early designs however. Bridges and flyovers are blots on many streets but the issues they present to pedestrians below can be fixed quite easily. With painting, planting, and better lighting the dark, gloomy oppressiveness can be alleviated. There’s many successful examples of that around SE1 in central London. If the street was be be rebuilt in the style shown on the left then it shows a rather optimistic view of future parking and driving standards given current behaviour. Shared surfaces often seem to be an invitation to drive off the road and onto the pavement locally. The whole pedestrian area would be covered in cars, some parked, some double parked, and some waiting. There’s also no sign of a cycle lane from the station to join the lane planned by Sainsbury’s about 100 metres away, though there’s ample space for one. The spot where the Sainsbury’s lane begins is behind the trees on the middle image above. There’s also no cycle stands shown. With buses from Thamesmead slow and busy it’s an ideal cycle route to invest in. 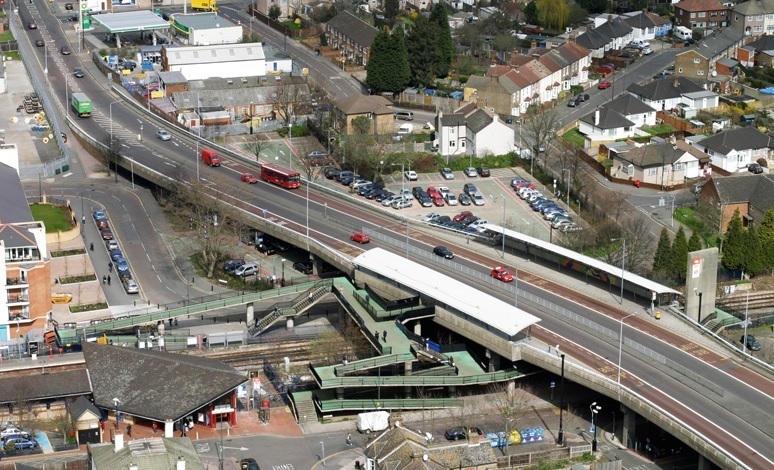 A segregated lane from the station, past Sainsbury’s, then along the road to Thamesmead should be an absolute priority. 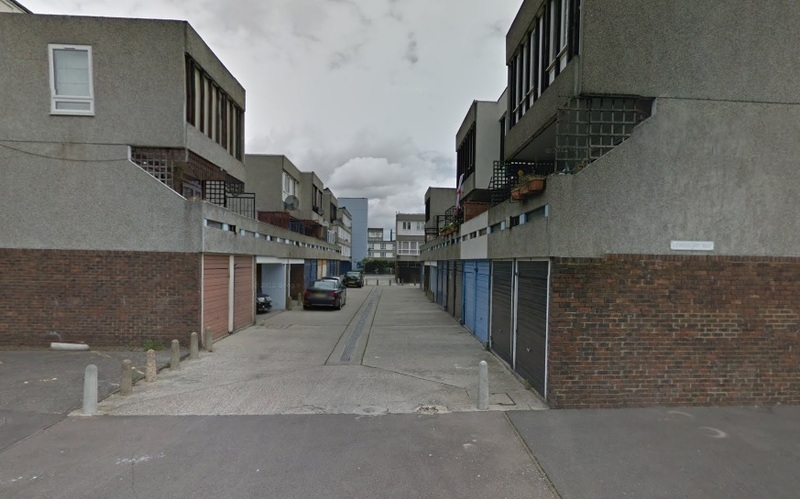 Bexley council have plans for a cycle route through back streets in Thamesmead heading to the station, on the passage seen above. That would require a cyclist heading from the station to leave the segregated stretch, turn right crossing a very busy road, then turn left crossing another busy road, to join the uninviting back street shown above. Not gonna happen. 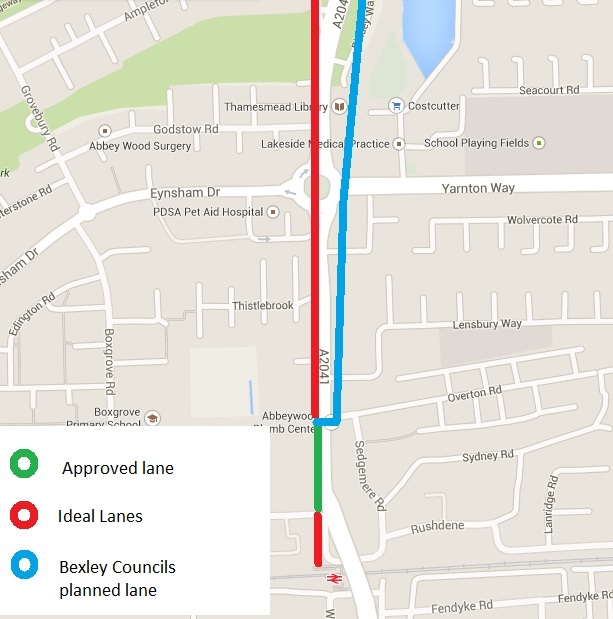 The map shows what is confirmed, and also what Bexley hopes to install. 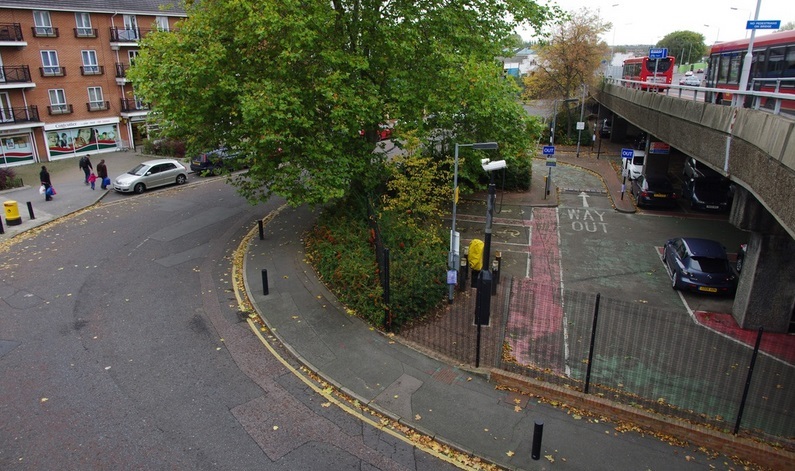 A better idea is to continue the segregated stretch straight past Sainsbury’s, along Harrow Manorway continuing to Thamesmead, on the ample space available to the left of the road as shown below. This would mean one less busy road to cross and offer a more direct route. Problem is, left of the road is Greenwich borough, and right is Bexley. In other semi-related news, the new Sainsbury’s, hotel, and flats development named ‘Cross Quarter’ has recently secured funding to begin construction. Demolition of the former Siemen’s factory is now complete. The first stage is projected to be finished by mid 2015. In total there’s £90 million available from Crossrail specifically for public realm improvements. Other sources of revenue to imprve the local area are future Local Implementation Fund money from the Mayor and GLA, along with Section 106 payments from developers. As more proposals inevitably arrive in coming years so will millions more to both councils coffers. Hopefully Bexley and Greenwich council, working together (eek! ), will submit ambitious plans to secure a good chunk of the initial Crossrail cash to make improvements soon to an area long neglected. Following those initial stages immediately around the station, a plan should be devised to fundamentally improve the Harrow Manorway corridor, cycle lanes, Abbey Wood estate, the co-op estate, Thamesmead Stage 1 and other housing areas nearby. All are within walking distance of the station and all have been neglected for far too long. The cash will soon be available to do so. Hopefully the desire is there too. Another great blog. Three main concerns, parking, parking and parking. According to the Southeastern site the main car park will be reduced by 50% on completion and Felixstowe staying roughly the same. There is unused land around the station but in private hands, how much the councils can and will contribute will be key to the stations success given the increased passenger volume expected from 2018. I can only see parking land gradually reducing over time. Too much money to be made from high density housing, and we do need it. Placing it by major stations is the ideal thing to do. In time the BT exchange (wrongly labelled as Thamesmead exchange) may go. Possibly a car park could go there, but it would have to be multi-storey to make best use of land. Even then it wouldn’t raise anywhere near as much as housing so developers would be who BT would sell too. To make up for lack of parking improving links from Thamesmead are a must. Wide segregated cycle lanes can be put in cheaply. There’s land to do it. Simple job, and millions coming the councils way gives them no excuse. In addition some kind of tram/train link from Abbey Wood to Thamesmead has be considered, heading over the river to east London. Another excellent post. Having the Bexley/Greenwich boundry cutting through such a key area really doesn’t help – not only does it depend on the councils working together, but it also depends on those councils actually prioritising ‘border’ towns. 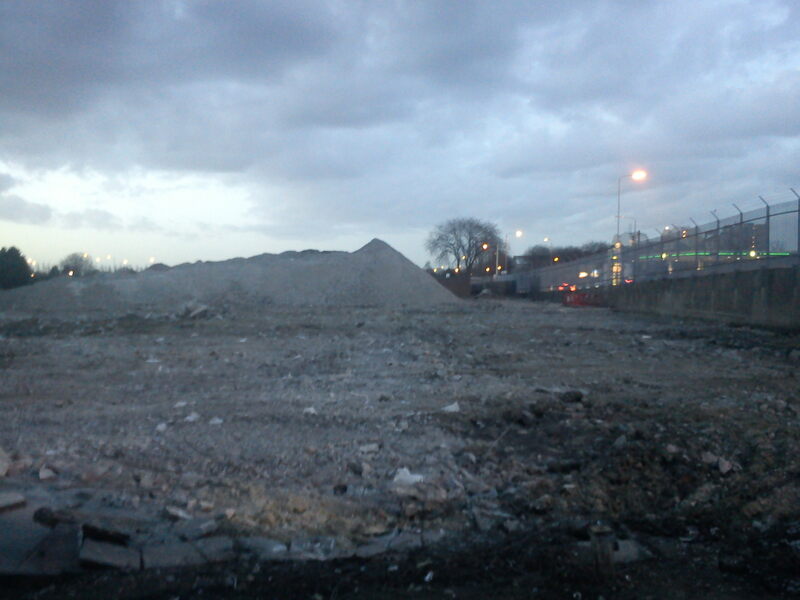 Bexley generally ignores Abbey Wood – see the ongoing mess of the former Harrow Inn site – while putting most of its energies into Bexleyheath, Sidcup etc. A similar tale could be told for Greenwich and its priorities. As for the parking – I think a lot of the parking and traffic from passing cars dropping off/picking up commuters is down to Abbey Wood being in Zone 4. I’d suggest that a lot of those cars aren’t owned by those living nearby, but more by people driving there from further afield for a cheaper fare. Improved bus and cycle plans might help, but I’m not sure they will fix the parking problem completely. One thing that could make a difference is that Crossrail will be a TfL service so people buying a season ticket for it should have free bus trips in any zone included. Looking at major centre’s of employment like Canary Wharf, for example, people from Bexleyheath could take a free bus and then use the station to get to Canary Wharf. They, or people giving lifts, would save on the driving costs and/or parking near Abbey Wood with a free bus. TfL would have to increase bus numbers which they surely will. The faster journey times from Abbey Wood (10 mins to Canary Wharf) would draw people from taking a train from Bexleyheath to Lewisham then the DLR to Canary Wharf so TfL will need to closely look at bus usage. Definitely true about being a border town. I also wonder if both being solid Labour areas means the party takes votes for granted so doesn’t put in any effort? Walking around there it certainly seems that way. Going to Abbey Wood can already be done on an Oyster travelcard, buses are already covered but people still drive to the area (to be honest, I’m not sure where they’ve all gone, I expected much more clogging of the local roads when the car parks shut). The Felixstowe car park got reasonable use but wasn’t full. The difference is that more people will be keen to drive to a zone 4 terminal stop where they stand a good chance of a seat on a new Crossrail train that will speed them into the city. What are everyone’s views on how quickly desirability to reside in Abbeywood will evolve? Can you see it being a hub for young professionals to live and commute into Canary WHARF and central London compared to other current offerings? Hey Jay, highly unlikey in it’s current state, however with major improvement in the Abbeywood area that should change i.e. if you looked at Shoreditch 10/15 yrs ago you would not want to live there either but now it one of the most up and coming areas in LDN. It’s a gamble i.e. it currently £kkk cheaer that anywhere in LDN and prices will go up in time but you need the right kind out outlets to be there for this to happen i.e quirkly shops & coffe bars etc. I think they should give money to house owners living down Overton Road in Abbey wood, particularly the pre victorian terraced houses on the same side of road as the corner shop. To give the houses down the road a face lift will help attract more affluent people into the area and make Abbey Wood more of a desirable place to live in. I also believe that abbeywood is an area for the future 11 mins to canary wharf is a no brainer why rent apartments along the crossrail route from Canary Wharf to Abbey wood when you can have a house for even cheaper and with the regenerated lenses abbey and bostall wood you have a bit of greenery not on the same level as Greenwich and Blackheath parks but slightly similar. I have bought an investment house in abbeywood because of this and in 3 years this has gone up in value by over 100% it can only increase in 2 years time . Although, I must point out that the negative image that abbeywood has helped as it meant that no need to compete with the big boys or fat cats .